Found each Saturday in the heart of downtown Phoenix, the Open Air Market at Phoenix Public Market celebrates its 12th Anniversary on February 4 with free yoga by Sutra Roosevelt, Maya’s Farm cooking demo, Native Seeds/SEARCH workshop, live music, swing dancing, limited edition anniversary shirts, giveaways to the first 50 people and cake! Visit the Facebook event page for details. The rest of February offers a robust calendar including an Iconic Cocktail Co. workshop on February 11, Shop with the Chef Series with Chef Allan Inocencio from Adobo Dragon on February 18 and Dig It Urban Gardens + Nursery is back on February 25. Additional details on upcoming programs below or visit http://phxpublicmarket.com/openair/events. Phoenix Public Market welcomes the return of Iconic Cocktail Co. the weekend before Valentine’s Day to demonstrate making cocktails featuring duos around the market. Stop by for a mocktail and learn new ways to add market items to your next craft cocktail. Then all you need to do is add the spirit! The demo will include three cocktail recipes featuring Iconic and other market vendors including Radish, Cotton Country Jams and Pour Jo Coffee. The Open Air Market at Phoenix Public Market boasts nearly 100 agriculture, artisan, prepared food, and household and skin care product vendors plus food trucks. Farmers sell hydroponic tomatoes, honey products, eggs, grass fed beef, produce and more. Food Trucks vary week to week but include Different Smokes BBQ, Naturally Sweet, Top It Waffles, Que Sazon and PAZ. Prepared foods and artisans span the gamut including bread, pickles, spices, cocktail mixes, and tamales plus soaps, pottery, baskets, and jewelry. For a complete list visit http://phxpublicmarket.com/openair/our-vendors. 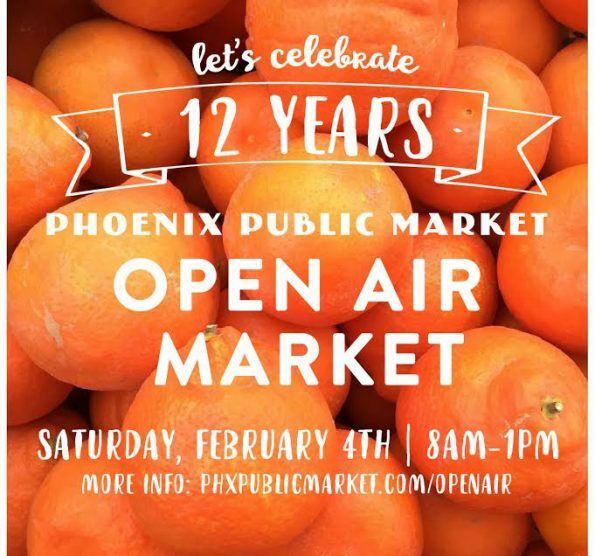 The Open Air Market at the Phoenix Public Market is a program of Community Food Connections (CFC), a 501c3 non-profit organization. Open since February 2005, CFC creates a downtown community-gathering place by supporting small farmers and businesses that strengthen sustainable food systems and produce healthy products for the local community. We are located next to the Phoenix Public Market Café.